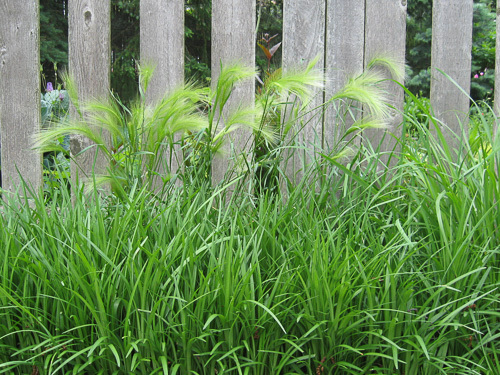 There’s no mention of Rod Serling’s gardening/landscaping interests on Wikipedia, and I’m sure he was making another point, but I couldn’t help thinking of the famous Twilight Zone episode when I saw this squirrel tail grass. In “The Eye of the Beholder”, a woman undergoes a series of facial reconstruction surgeries to correct a deformity. When the bandages are unwrapped at the end of the show, we see that the woman is strikingly beautiful, but she is devastated that the surgery has failed. How could such a pretty woman be so distraught over her appearance? We understand when the doctors and nurses pull down their surgical masks to reveal deformed, pig-like faces. This planting of lilyturf has been growing along without issue for years. This year, a clump of squirrel tail grass spontaneously appeared. You may know squirrel tail as a common grass along the highways. It seems to grow in the most adverse conditions, enduring heavy doses of salt and very gravelly soil. We’ve never planted it in a garden. Yet. In the stack of books I drag around to show clients, I have a picture bookmarked of a Colorado garden filled with short grasses, stone, and gravel – very well suited to an arid climate. Some people love the picture and some don’t, but the most striking plant in the photo is … squirrel tail. So, is the squirrel tail in this picture a weed? Should we pull it out? 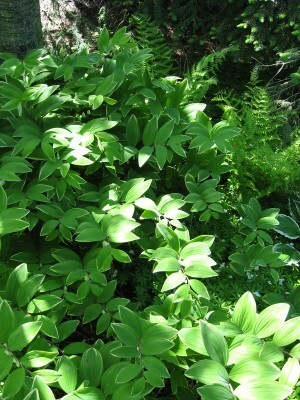 Should we look down our noses at a plant that we usually only see at 65 miles per hour? Well, the bandages are off, and it’s here to stay if it wants to.